Special Features | TOYAMA CHIHOU TETSUDOU INC. 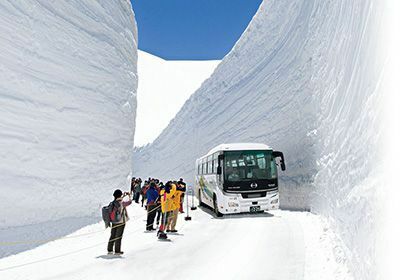 This mountain sightseeing route runs through Japan's Northern Alps, from Toyama to Nagano, and has peaks up to 3,000 m high. Passengers can transfer between various means of transport including cable car, ropeway, and trolley bus to see majestic views of the entire range. 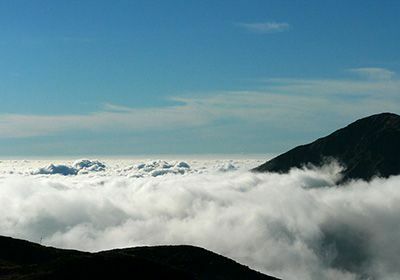 There are also numerous courses that give everyone from trekkers to even serious mountain climbers something to enjoy. 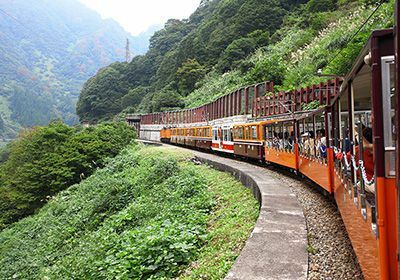 The Alpine Route is home to a number of things that are number one in Japan, including the tallest dam, the oldest mountain hut, and the highest-elevation train station. Endless picturesque views ensure many unforgettable moments. 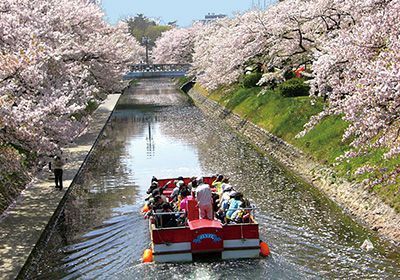 Come to Toyama and experience the grandeur of mother nature throughout the seasons! This railway takes passengers on a trip (80 minutes each way) through natural surroundings on the Torokko electric train. From the fresh greenery of spring to the clear flowing streams of summer and colors of fall, every season presents a bounty of beautiful sights. Look out the window as the train passes over several bridges and through tunnels. 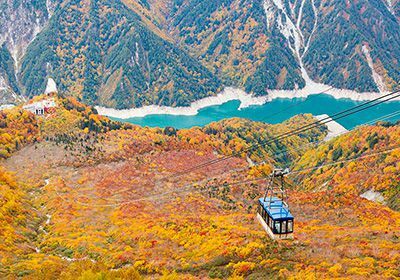 Among the many stunning vistas to be seen along the way are the Atobiki Bridge soaring 60 m over the Kuronagi River, the secluded open-air baths of Kanetsuri Hot Springs, and Kinshukan, a renowned place to enjoy the colors of fall. 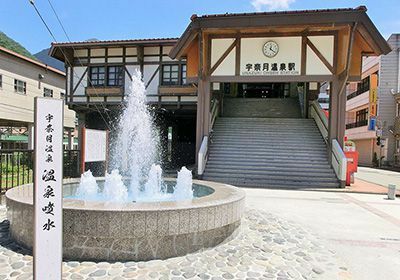 You can also stop for a rest or a bite to eat at the restaurants and souvenir shops at Kanetsuri Station and Keyakidaira Station. 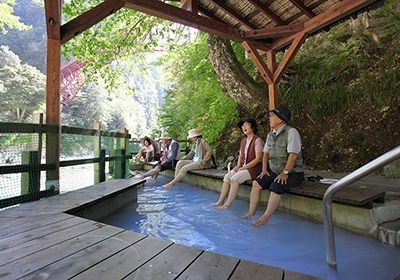 Spend a full day and soak up mother nature in Kurobe Gorge! 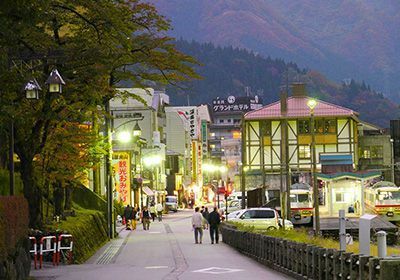 Unazuki Hot Springs is located at the entrance to the Kurobe Gorge, and its ability to accommodate 3,500 visitors makes it the largest hot springs village in Toyama Prefecture. Drawing from the Kuronagi Hot Spring at the headwaters of the Kurobe River, this hot springs has been visited by many writers and artists since it was opened in 1923. Said to have the clearest water in Japan, the colorless and transparent hot waters that evoke the clear water of the Kurobe River are simple alkaline hot spring waters that are good for the skin. The steaming water can reach temperatures of 90 degrees and above, warming the body from the inside. 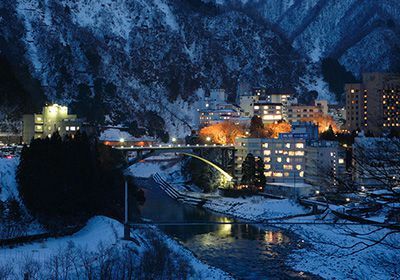 The many inns and hotels along the Kurobe River afford seasonally unique views of the mountains in the gorge, and their modern amenities ensure a comfortable stay. In the gorge, you can also savor fresh seafood caught in the nearby Japan Sea and try excellent local sake and beer made from the gorge’s famous water. Therapeutic for: rheumatoid arthritis, locomotor system conditions, neuralgia, etc. 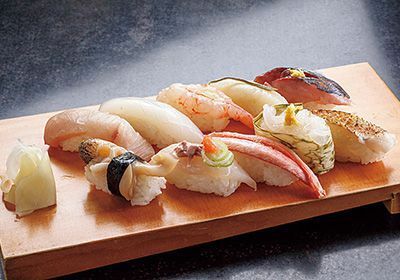 If anything represents a classic Toyama flavor, it's trout sushi. 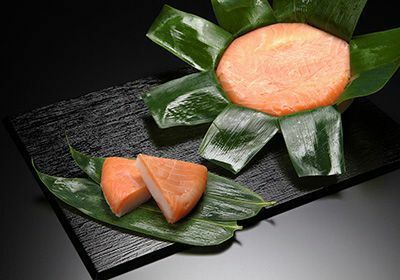 The refreshing smell of wakasasa (young bamboo leaf) and the pink flesh of trout, which evokes the color of cherry blossoms, are things that stay with you. Whetting the appetite further is a bed of rice peeking out underneath with a jewel-like luster. 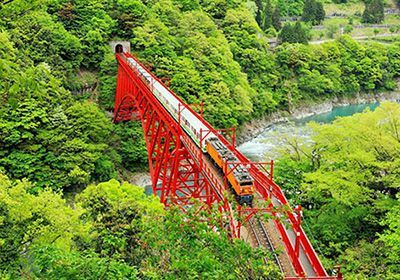 As the land of railway travel, Toyama Prefecture is a favorite destination for train fans. 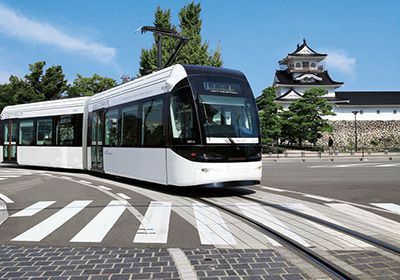 Get around the city with a bargain-priced passenger ticket that comes with three coupons usable towards Toyama's famous trout sushi and sweets and lets visitors ride 1-day free on intra-city trains and the CENTRAM light rail that runs throughout downtown Toyama. Tickets allow for 1-day hop-on hop-off travel. 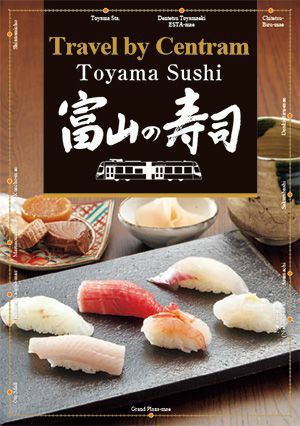 While enjoying a relaxing train ride, try different kinds of trout sushi and find the one you love. Some of Japan's most famous springs, Toyama's springs are blessed with high quality, abundant water flows. Locally-brewed sake in Toyama is made from these clean waters and from delicious rice. Many brands are renowned throughout Japan, and there are numerous fine products that exemplify the skills of their brewers. 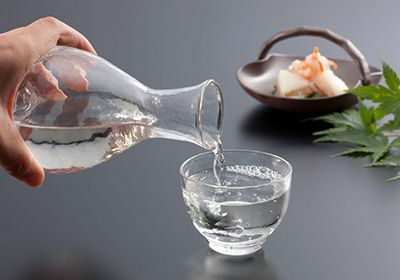 There is no greater luxury than enjoying a high grade sake alongside Toyama's finest fresh seasonal seafood. Many visitors also enjoy touring the area's many distinctive breweries. The water that wells up inside this brewery was chosen as one of Japan's Selected 100 Exquisite and Well-Conserved Waters by the Ministry of the Environment, and goes to make truly high-quality brewing water. Brewed with attention to achieving good throatfeel and featuring a bold flavor and subdued aroma, the company's Junmai Ginjo and other products can be enjoyed chilled or warm. One iconic brand is Maboroshi no Taki. This brewery makes its products using groundwater from the Kurobe Alluvial Springs, which number among the Selected 100 Exquisite and Well-Conserved Waters. The company's flagship sake, Ginban, has a crisp, dry taste and is a favorite of many in Japan. This brewer's focus is on achieving "sake less likely to cause hangovers" the next day. A brewery steeped in the atmosphere and culture of Uozu, a seaside town famous for its mirages. 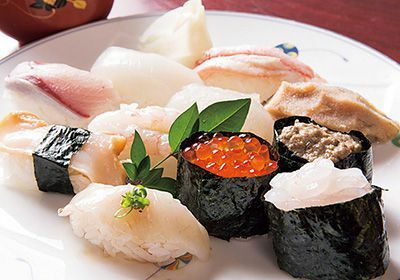 A longtime favorite of many, the brewery's iconic brand Hokuyo has a dry, clean taste that goes well with another favorite of fishermen: seafood. It's a good sake to have with a meal. Maker of such brands as Chiyozuru, this brewery focuses on products that go down easier for those who do not normally drink sake. Junmai Ginjo is popular for its dry taste and soft mouthfeel. The brewery also makes sake from deep-sea water taken from Namerikawa. 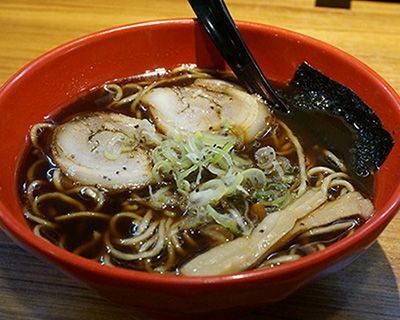 "Toyama Black," as it's called, is defined by its jet black soup. Originally developed as an accompaniment for rice, it was made extra salty for members of the working class following the war. 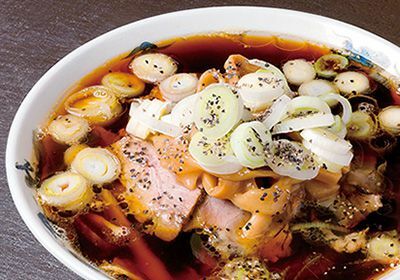 The rich soy sauce-based soup is enhanced by the umami in the broth, curiously pulling you in after the first bite. Meet the granddaddy of Toyama Black. Marvel at the sheer blackness! 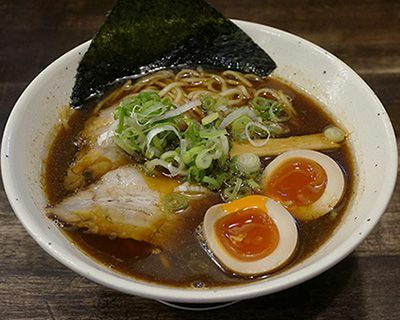 Nishicho Taiki was established in 1947, and Nishicho Taiki ramen has become virtually a synonym for black ramen due to a historied flavor that keeps you coming back. Richly-flavored slices of roasted pork coupled with white rice provide an enjoyable chewiness. The sheer blackness of the soup may shock you, but try it and you'll be surprised how lightly flavored it is. It also has a full-bodied and well-defined flavor, something achieved by the deep waters of Toyama Bay and the flavor of broad velvet shrimp. Also popular are the restaurant's original, self-cooked whole grain noodles that have a springy chewiness. MSG-free ramen! 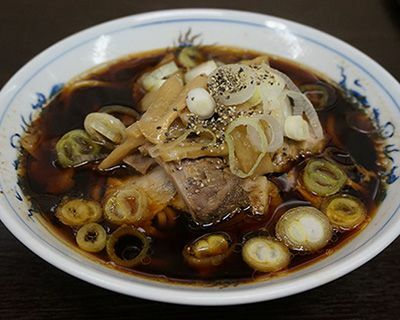 A marriage of a rich tonkotsu (pork bone) soup with a sauce made using a handmade and naturally-brewed soy sauce from Oyabe. The home-crafted noodles made from Japanese wheat are also divine. Dubbed Japan's "natural fish preserve," Toyama Bay is a treasure trove of aquatic resources and a home for some 500 species of fish out of the 800 said to live in the Japan Sea. 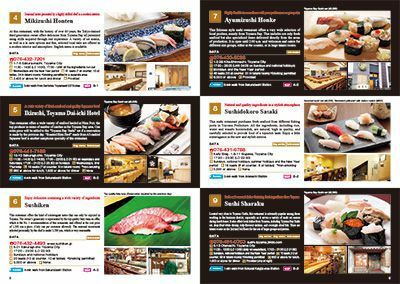 There are many restaurants in the city, from those serving Toyama Bay Sushi and catering to customers looking for natural, fresh, top-tier sushi available only in Toyama, to affordably-priced conveyor-belt sushi restaurants with local fish caught that morning. 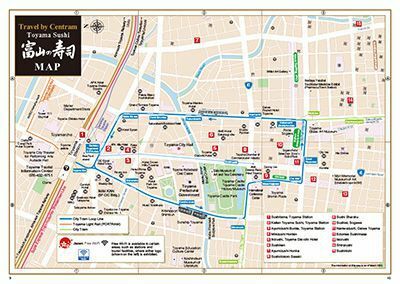 Here you'll find a list of restaurants in Toyama never more than a 10 minute tram ride away from a station. Get details about the restaurants, including how to get there, whether they have an English menu, and whether the staff speak English. Also includes a map and tips on how to eat sushi properly. Copyright TOYAMA CHIHOU TETSUDOU INC. All rights reserved.